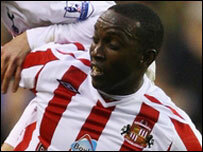 Sunderland veteran Dwight Yorke made his name as a striker but is enjoying a renaissance as a holding midfielder in Roy Keane's side. The 36-year-old has impressed in a deeper role and Yorke feels the switch has given him a new lease of life on the pitch. He told BBC Radio Newcastle: "I'm still enjoying the game even though I'd like to win a few more football matches. "If I didn't think I could play there I'd walk away." The Trinidad and Tobago international first began playing in a midfield role for his country, and has since made the transition at club level. "I felt I can play in this position," said Yorke. "And I feel like I can compete with the younger lads." Yorke brings much experience to the Black Cats but prefers to let his feet rather than his lips do the talking. "There's different ways and different approaches," he said. "Some people rant and rave like a pitbull terrier but that's not just my style. "As a team we're making errors and mistakes and it's costing us football matches and with 15 games left we can't afford to make any more mistakes. "Everyone is working hard to make sure we eradicate that from our performances."